The Buyer: Brightree LLC is the largest provider of cloud-based software for the post-acute care industry, serving 2,700 companies in the HME/DME, HME pharmacy, home infusion, home health, hospice, orthotics and prosthetics, and rehab home care segments. The Seller: Strategic AR (www.strategicar.com) is a provider of patient billing and collection services for the home medical equipment industry. In both 2012 and 2013 Inc. magazine ranked Strategic AR as one of the nation’s fastest growing private companies. 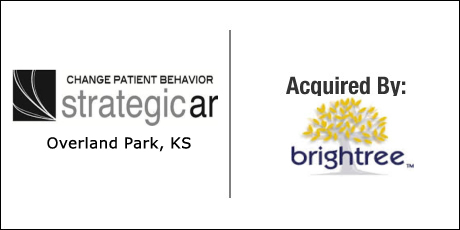 The Close: Brightree approached Strategic AR about a transaction in summer 2013. brightree had been pursuing a number of transactions to enhance their offerings, and management informed the owner of Strategic AR that his company was their first choice to enhance their patient billing suite. Strategic AR’s customer based contained a majority of clients that were using the brightree platform, and that number was growing over time in a continuous trend. If brightree were to acquire another patient billing resource, they would likely attempt to redirect all business to that provider. The owner of Strategic AR was concerned that if the deal were not to come together for some reason, a failed outcome could endanger the survival of his company. The DVS Group was brought in to assist with the negotiations of price and terms for the transaction. DVS also recommended a local law firm that had both M&A and intellectual property experience to help with the documentation of the transaction. All parties worked together to obtain adequate cash at closing, participation in future performance that provided risk controls for both buyer and seller, and attractive employment terms for the seller during a transition period.